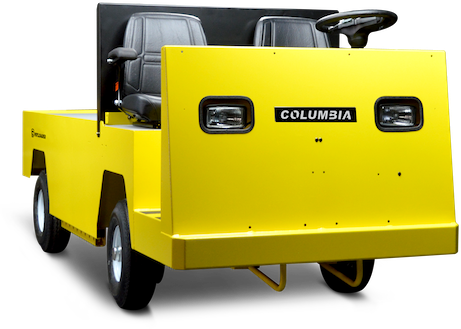 The Payloader offers unmatched versatility in carrying and towing capability while providing a level of maneuverability beyond the typical heavy material handler. With a slim profile and exceptional turning radius, the Payloader replaces dangerous forklifts to deliver materials through tight spaces – all while improving visibility and overall safety. With an optional rated towing capacity of nine tons, and a range of carrying capacities from 2,400 to 4,000 pounds, the Payloader can handle all kinds of loads with optional extra seating and carrying capacity for special applications and extra heavy requirements. Pure electric power and the same steel chassis used throughout our vehicle line offer an impressive level of access, range, and ruggedness for any task it's put to. Curb-to-Curb: 264 in. Intersecting Aisle: 92 in. 1,690 lbs. 1,720 lbs. 1,850 lbs. 2,400 lbs. 3,200 lbs. 4,000 lbs. 6,500 lbs. 10,000 lbs. 18,000 lbs. Schedule a local demonstration using the form below or contact our team to learn more about the Payloader.